When I was very young, games were all about high scores. I can remember my uncle taking me to the arcade in the mall, where we'd play shooters and beat-em-ups, pinball and pac-man. At home, on the Atari, we'd compete in tank warfare, swing on vines across canyons, and box against one another for hours. But in the end, the focus was always on the high score. That changed when I received the Nintendo Entertainment System for Christmas one year. Suddenly, the high score was an afterthought. In Super Mario Bros., what mattered was saving the princess, not gaining points. In the Legend of Zelda, the main goal was adventuring, not stockpiling numbers. So when my friends and I first started playing Gauntlet II, we had a warped mindset. Back then, you couldn't look online to learn more about games because there was no internet we could access. All we knew about Gauntlet was that all four of us could play together, and we would dive into that dungeon as deeply as we were capable, trying our best to beat the game. It quickly became a fan favorite among my friends, mostly because it allowed four player simultaneous play, a rarity among games back then. I have many memories of needing food badly only to find my supposed teammates shooting that much needed food before I could pick it up. Those were great times, and I look back on them fondly. Yet the strongest memory I have is when one of my friends had a sleepover for their birthday, and we all vowed to finally beat Gauntlet II. We got started early on, and although we did many other things that night, there was always at least two players on the NES, working together to keep the party alive and progress further and further into that dungeon. Once we reached 50 levels deep, we were further than we had ever been, yet the game showed no signs of nearing the end. A friend said it can't be more than twice as many levels than Super Mario Bros., which had 8 worlds of 4 levels each, so we eagerly looked forward to level 65. Once it came and went, we all came back to the tv at level 99, only to find that level 100 was just another level of this impossibly deep dungeon. But we persevered. While most of us played other games late into the night, we always had a rotation of two players on the NES, continually playing through each stage. Eventually, it became not just methodical but hollow; this was not hard, like TMNT or Battletoads, but it tried our patience nonetheless. As the hours wore on, we got more and more tired. Still, we would all group up in front of the tv at level 150, level 200, level 250.... But it seemingly never ended. What if it had no end? What if this game was a throwback to the older games before the NES; what if it was like Pac-man, where no matter how long you played, you could never really beat it? But there were rumors even then that Pac-man could be beat, if you lasted long enough. We had no way of knowing whether this was true back then, but now the kill screen on level 256 of Pac-man is better known -- could the same be true of Gauntlet II? Eventually we were "shape without form, shade without colour; paralysed force, gesture without motion". We were dead on our feet, and all other games came to an end. We pulled our sleeping bags close to the tv and took turns trying to stay awake past level 300, 350, 400. Some of us fell that night, not just in the game, but to the sandman himself. Those of us who remained were sure -- so absolutely sure -- that the final level must be 500. It's such a round number, and no dungeon can be deeper, surely. Surely. But alas, 500 came and went, and we lost all hope. It was late. We were tired. Every second in the game our characters lost a portion of their life, and no amount of health would keep us alive throughout the night without someone adventuring for additional food. If we slept, it would be game over. One of us had to be sacrificed. So I offered to take the first watch. One by one, the rest of my friends fell fast asleep while I half-played, half rested-my-eyes. I wasn't progressing through levels, exactly, but I was keeping the game session alive, so that in the morning we could push to what would surely be the true ending level: 999. I felt so certain that 999 would be the final level, because there was only room for three digits in the UI. I started daydreaming about what it might be like. What reward might the game designers have cooked up for whomever could make it to that final stage? Would there be some fearsome boss? Would there be a princess to save? Would we finally get out of this abominable dungeon? 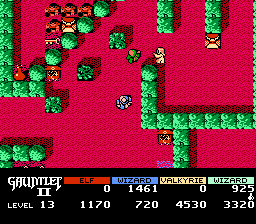 I imagined an ending like that of Dragon Warrior, as Dragon Quest I was known in the US at the time. Something with music, and a congratulatory screen, saying that we had saved the kingdom by making it to the very last level. But then, abruptly, I was shaken awake. Before me were my friends, and, behind them, the Gauntlet title screen. Breakfast that morning was not very fun. Edit (November 2018): A reader pointed out a truth that I'd never even considered: there isn't a final level. After level 998, there's a treasure level, and then you get kicked back to level 1 again. The video below shows the loop back to level 1.